There’s a growing trend in the world of wine that many wine producers have been slow to catch up to. It doesn’t have anything to do with grapes, blends or finishes. It has to do with size. Consumers increasingly prefer smaller wine portions, particularly millennials and people in emerging markets, making it something of a mini-revolution. The 750ml bottle has been the staple of wine packaging for centuries. For previous generations, this standard size was not only conducive to production efficiency, it also met the demands of consumers. They tended to have larger families, be less worried about health, and drink more wine on a daily basis. Market analysis, however, shows this trend is changing – fast. 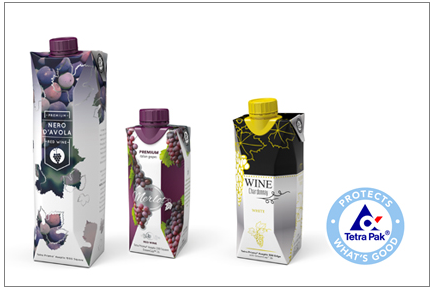 “One reason behind this change is that households are getting smaller, with fewer people and less space for storage,” says Libby Costin, Marketing Vice-President at Tetra Pak, who has been keeping a close eye on developments. Single person households will grow faster than any other household demographic globally between 2016-2030, according to Euromonitor International. The largest group with single households are younger consumers, but this is also becoming more common with seniors. Traditional packaging doesn’t always meet these modern consumer needs, and wine packaging has been no exception. Until now. Enter the ‘mini-revolution’ – the growing global demand for wine in smaller, more portable and more convenient packaging. Emerging markets are also driving the change for smaller packages. China alone currently represents 71 percent of global still wine consumed in portion packs. Wine consumption in many emerging markets is only starting to take hold, where people are not constrained by traditional packaging customs. In addition, single households in emerging markets have almost doubled from 2000-2015, according to Euromonitor. Millennials and emerging markets certainly contribute to this trend, but they’re not alone. Discover more about this ‘mini’ trend and read the latest news on wine packaging and production.